Cover of French satirical magazine Charlie Hebdo on Jan 6 one year after massacres at its offices in Paris carried out by Islamist extremists that involved the killing of 12 people at its offices. Charlie Hebdo is commemorating a year since the shooting at its headquarters triggered more violence carried out by perpetrators in the name of Islam. And the latest front cover of the satirical magazine is taking flak from Christian and Muslim believers. The publishers put a million magazine copies on newsstands in France Jan. 6 with a cover featuring a bearded Kalashnikov-bearing blood-stained religious figure accompanied by the text: "One year on: the assassin is still out there." 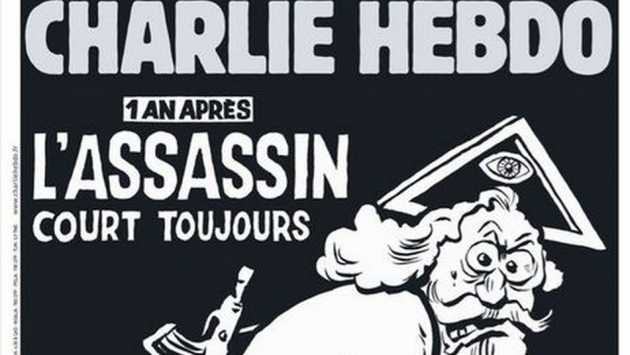 The bearded figure represents God, Riss the edtior of Charlie Hebdo told CNN. As the special anniversary issue of Charlie Hebdo hit the stands, its publication marked a year of carnage which started on the morning of Jan. 7, reported Ireland's Independent newspaper. Then, to the horror of the watching world, Islamist terrorists calmly murdered 12 people in Paris for the crime of offending their religion before moving on to a kosher deli to murder a further five people for the crime of being Jewish. The Vatican daily newspaper Osservatore Romano commented Charlie Hebdo's treatment of religion "is not new," while noting that religious figures have repeatedly condemned violence in the name of God. "Behind the deceptive flag of uncompromising secularism, the weekly is forgetting once more what religious leaders of every faith unceasingly repeat to reject violence in the name of religion -- using God to justify hatred is a genuine blasphemy, as Pope Francis has said several times," said the Vatican paper. "In Charlie Hebdo's choice, there is the sad paradox of a world which is more and more sensitive about being politically correct, almost to the point of ridicule, yet does not wish to acknowledge or to respect believers' faith in God, regardless of the religion." The special edition of Charlie Hebdo marks one year since brothers Chérif and Saïd Kouachi burst into magazine's offices in Paris embarking on their killing spree. The attack on Jan.7, 2015 was claimed by al-Qaida's branch in the Arabian Peninsula and followed a 2011 firebombing of the Charlie Hebdo offices forcing it to seek new premises. Police protection was needed for the staff from the date it published cartoons ridiculing the prophet Muhammad in 2006. Pope Francis condemned killing in God's name after the attack but said religion should not be insulted. "To kill in the name of God is an absurdity," Francis told reporters on the papal plane on an Asian tour. The latest Charlie Hebdo cover is one of many efforts to commemorate the 17 people killed over three days of shootings. French President Francois Hollande unveiled plaques with the names of victims at various locations in the city. The plaque outside the offices of Charlie Hebdo lists 12 names, one for each of the staffers killed there. Hollande also participated in ceremonies for a policeman who was killed in pursuit of the attackers and for four shoppers killed at a Jewish market, Time magazine reported. The brazenness of the attack, much of it captured on camera, ensured that an ominous start to the New Year. "As we now know, it was only the first assault in a wave of attacks in the last 12 months," commented Ian O'Doherty in the Irish Independent. It, "included the slaughter of tourists in Tunisia, a downed Russian passenger jet in Egypt, the San Bernardino mass shootings and, of course, what is now known simply as the 'Bataclan massacre', when Paris was once more targeted in an operation which left more than 130 innocent gig-goers and Friday night revelers dead." Abdallah Zakri of France's Observatory against Islamophobia denounced the Jan. 6 Charlie Hebdo cover as: "Violent and very insulting towards religion." "Of course, it's not violent in the least, especially when placed in the context of a magazine which had most of its staff murdered. "That, by any rational definition, is violence - on the other hand, a cartoon is simply a cartoon, no matter how much it may infuriate you," wrote O'Doherty. But American commentator Bill Donohue, was scathing of Charly Hebdo's cover one year after the massacre. "The publisher of Charlie Hebdo, Stephane Charbonnier, was among the 12 people killed in Paris on Jan. 7 last year. The New York Times described him as a 'staunch left-wing activist, raised in a family of communists.' He was also an unrelenting bigot," wrote Donohue, a conservative Catholic. "Charb, as he was known, did not deserve to be shot, but attempts to lionize him are grossly misplaced. Make no mistake about it, he was no martyr - he was a narcissist who deliberately taunted people of faith in a vile fashion," Donohue writes in Newsmax. "Eight of the staffers were killed in the massacre, Now Charb's successor, Laurent 'Riss' Sourisseau, is capitalizing on the killings by publishing an anniversary issue," he says.